So you want to be a military science fiction author. You’ve read the classics from all the major authors, and you’ve got a great idea for a novel. Except you haven’t served in the military, and don’t know much beyond what you’ve seen on TV and in movies. Here are 11 books of military history you might want to read before diving in. Constructing a war, military organizations and characters are complicated events, that require a bit of legwork in order to create a believable world that your characters will operate in. Fortunately, there’s no shortage of books about military history, and the state of warfare at any point in human history. For this list of background reading, I’ve focused mainly on modern warfare, rather than some of the genre’s more historical and foundational books such as The Art of War, History of the Peloponnesian War or On War, both of which are essential reading for this field. This post was originally published August 8, 2015. 1) One Bullet Away: The Making Of A Marine Officer, Nathaniel Fick. Fick was an officer in the United States Marine Corps, where he served in Afghanistan and later as a Recon Marine in Iraq. His memoir of his time in the service, One Bullet Away begins as he joins the Marines in the late 1990s, and carries through his training at Officer Candidate School. It’s not until you’re a third of the way through the book when the attack on the World Trade Center occurs, and Fick is off to war. What makes One Bullet Away a compelling and useful read for a military science fiction author is that it’s firmly about Fick’s experiences and how that supported his journey becoming an officer. It’s one of many soldier narratives to come out of the Iraq/Afghanistan conflicts, but his is one of the better ones that I’ve read. He goes carefully through his experiences and documents them with a good eye: he’s an excellent writer and doesn’t dramatize his experiences. We learn how he trained, led and fought, but his language isn’t dynamic—rather, it’s artistic, and he spells out the times that he did see combat expertly, without bravado or exaggeration. This is an honest account, and his writing and frank descriptions make this an excellent book to read through and emulate. 2) American Soldiers: Ground Combat In The World Wars, Korea & Vietnam, Peter S. Kindsvatter. This is more of a scholarly text, but it covers some really important topics when it comes to studying US Military History: how has the experience changed for American Soldiers in World War I, World War II, Korea and Vietnam? Kindsvatter served in the US Army for over two decades, retiring as a Lieutenant Colonel before becoming the commanding historian at the US Army Ordnance Center and Schools at the Aberdeen Proving Ground. This sounds like a bit of a strange topic, but it’s an essential one for anyone wanting to understand the changing role of the military. Leaving aside all of the political and social contexts that support military strategy and theory, what were the experiences of soldiers (in this instance, US Soldiers) throughout some of the 20th Century’s most devastating conflicts? Understanding how individual soldiers and units coped with what they were ordered to do is a crucial understanding that any story must have. The high-level strategic stuff is important, but those individual experiences are equally so. 3) Ashley’s War: The Untold Story of a Team of Women Soldiers on the Special Ops Battlefield, by Gayle Tzemach Lemmon. How does a predominantly male fighting force interact with a society where women are fiercely protected and sheltered? Lemmon’s book examines the creation of Cultural Support Teams, where women were deployed alongside Special Operations forces in Afghanistan, where they could help the Army comply with cultural demands. The takeaway from this book that I found important was that armies invading a foreign nation are almost inherently unable to work closely with a local population to fulfill their mission. In Iraq and Afghanistan, enormous cultural differences have stymied efforts to win over hearts and minds, and programs like this show a new approach to the battlefield that can aid a military force in its mission. Furthermore, this underscores just how complicated the battlefield can be—and this is just here on planet Earth, where we share the same species. This situation would only be more complex when you throw an alien race in the mix, one with cultural norms that are completely removed from what we have here on Earth. This is a stunning book about the rigors of combat. Junger is probably best known for his book, The Perfect Storm, and for the documentary that came out alongside this project, Restrepo. In this volume, Junger covers the soldiers of Battle Company as they were deployed to the deadly Korengal Valley in Afghanistan for over a year. The narrative is stark and hard, and Junger pulls together a complete picture of this company as they spend months in the deadliest part of Afghanistan in 2007. What makes War really useful is how focused it is on the soldiers and how they cope with where they’re located—this is an intensely personal story of combat. Junger provides you with a dizzying array of details, from weapon types to locations, but never does this in a straightforward fashion. And that means he does a lot to capture the disorienting nature of the ongoing battle these guys waged. The men of Battle Company went on patrol, took fire, lost their lives, and waited for the next battle. Junger captures the boredom and the ups and downs of the combat he witnessed while he was over there. Ultimately, he comes to the conclusion that the soldiers on the line don’t fight for ideology or some abstract ideal: they fight to make sure that the man next to them will make it home safely. 5) The Modern Mercenary: Private Armies And What They Mean For World Order, Sean McFate. We reviewed McFate’s book earlier this year, and it’s a book that’s well worth picking up for the sheer number of ideas that he presents throughout. Looking at the past to see how wars were fought with private organizations, McFate also extrapolates from the current environment, to predict the future. The wars that are coming soon aren’t going to be the sorts of conventional wars that we’ve seen in the past, or even those like Afghanistan or Iraq: they’ll be far more complicated and delicate. What’s most valuable about this book is how he examines the modern day power structure, and the ways private military companies on the battlefield can really upend the balance of power in the world. There’s nothing crazy here like private companies such as Walmart or The Gap forming their own armies, but he lays out a compelling argument for what the relationship between the use of force between governments and these companies. Something to consider in this instance is just how force is used in the world that you’re creating: is it exclusively used by a state power, and what are the implications there? 6) Learning To Eat Soup With A Knife: Counterinsurgency Lessons from Malaya and Vietnam, John Nagl. As the Iraq War raged on in 2007, the United States deployed an additional 20,000 soldiers into the country in what’s now called the Surge. Part of this mission was to help bring the war under control, but it also came with some new approaches under General Petraeus. Counterinsurgency became a major topic of discussion within military circles, and the military began to adopt new strategies forwards attacking a non-conventional military. One of the chief architects of the Army and Marine’s new Counterinsurgency manual was John Nagl, who looked back to the British experiences in Malaysia and the US experiences in Vietnam and looked at what lessons could be pulled out of both conflicts. And he’s written a fascinating book that looks very specifically at some of the tactics that were used, and how successful they were. While there have been some significant issues with the use and implementation of Counterinsurgency tactics, there’s some real merit to some of the arguments, chiefly about how militaries and soldiers need to operate in complicated battlefields. When it comes to military science fiction, understanding and mapping out exactly what motivates an enemy force or enemy civilian body is something that will bring a bit more depth to the battles that your fictional characters will be fighting, as well as bring your combat and strategy beyond just “These guys shoot those guys.” As a bonus, it’s worth picking up The U.S. Army/Marine Corps Counterinsurgency Field Manual. 7) Wings, Women & War: Soviet Airwomen in World War II Combat, Reina Pennington. Pennington’s history of the Aviation Group 122 is an absolute must-read for any readers of military history out there: it’s a thorough and detailed account of the legendary female Soviet air unit. In it, Pennington recounts the bravery and technical skill required of the female pilots, who served with distinction during the Second World War. This history is part of a growing body of scholarship within the military history field that is specifically examining the experiences of female participants in warfare: a population long ignored within the field. The book serves as an excellent examination of the unit throughout some of the most devastating battles during the Second World War. This book is particularly useful as an examination of a unit’s combat record after the fact, but also a stark reminder that some parts of history are simply ignored. It serves as a good example of the sheer complexity of the conflict, and how wars are enormously difficult to sum up in a single text. It’s good to remember that any story about a war will tell just a small sliver of the whole picture. 8) Wired For War: The Robotics Revolution and Conflict in the 21st Century, P.W. Singer. We’ve been fans of P.W. Singer and his books here at io9 for a long time: Wired For War is probably one of the best books out there about drones and wartime robotics. Along the way, Singer peppers his books with references to science fiction novels and movies. What makes this a stand-out book isn’t so much the hardware that he discusses (the stuff that’s on the battlefield now is primitive compared to what will be out there in the coming decades), but how robotics and automation shakes up the command structure on the battlefield, and what the implications there are. This isn’t a trivial consideration: leadership on the battlefield is crucial, and the role of commanders overseeing an engagement has drastically shifted. In a future where technology is pervasive on the battlefield, their role will continue to change, as well as the specific relationships between high ranking officers and the soldiers carrying out their orders on the field. As a bonus, check out Singer and Austin Cole’s novel Ghost Fleet, which pulls in a lot of the lessons from this book and some of his others. 9) The Untold War: Inside The Hearts, Minds and Souls of Our Soldiers, Nancy Sherman. Sherman’s book covers ground that has gotten a considerable amount of attention in the years since the beginning of the War On Terror in 2001: the psychological well-being of soldiers going off to war. In this book, she looks at the ethical decisions that soldiers must endure as they go about fulfilling their duties. This isn’t a book that looks simply at psychological disorders such as PTSD or the physical wounds that drastically changes soldiers’ lives: it’s a deeper look at the toll that warfighting takes on soldiers, and how they come to terms with what they might be asked to do. When understanding how soldiers operate, it’s important to understand that their job is among the most difficult, and contradictory: being asked to kill for their country. The toll that this can play is high, and understanding this can help add to the emotional depth of one’s characters. 10) Vietnamese Women at War: Fighting For Ho Chi Minh and the Revolution, Sandra C. Taylor. This is an interesting, academic text that I originally read for my master’s degree. In it, Taylor examines the experiences of female soldiers during the Vietnam War and the complicated role that they played on the battlefield. Taylor not only explores what the women did on the battlefield—but also, the complicated ways in which warfare and gender interact. Warfare is perceived as a largely a male-dominated occupation, despite the numerous contributions of women to generations of warfare. This book is very useful in that it explores these topics as sociology, rather than as straight up history, and it serves as a useful reminder to would-be military science fiction writers that on the battlefield, gender is both complicated and an important factor to consider. 11) Love My Rifle More than You: Young and Female in the U.S. Army by Kayla Williams. Kayla Williams’s memoir follows her experiences as one of the women in the US Army. Enlisting before September 11th, she later served in Iraq and dealt with the complicated and contradictory experience that she found there. Williamas discusses her own, personal experiences serving in the US Military, and this is a solid example of the ‘Solider Memoir’ genre, in which soldiers go back and recount their own experiences. This, and other entries in the genre, portray war from the viewpoint of the individual soldier facing the enemy, and this personal view is crucial above all others: what is war like for the people who wage it? 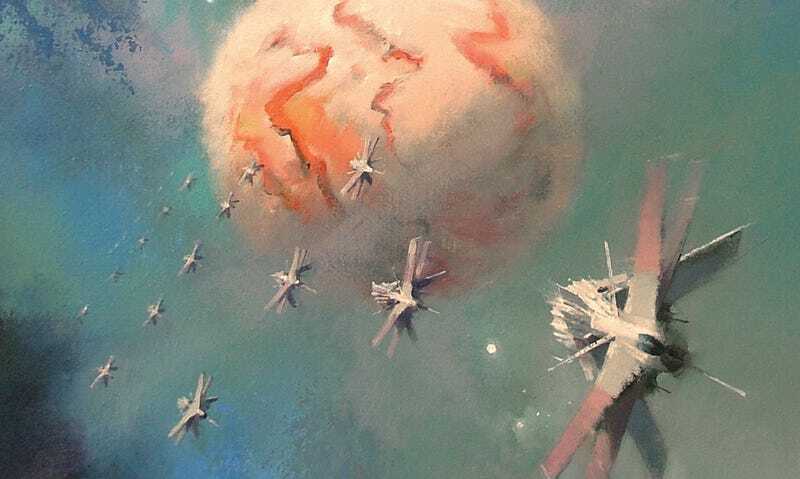 After all, the drama in a military science fiction novel comes down on the central characters, and their own struggles with combat in the near or far future. The above certainly isn’t an exhaustive list. The military history publishing field has a nearly infinite number of books about the subject, and there’s going to be a lot of others that will help with specific situations, eras, tactics and equipment that you can draw upon. What books of military history do you find most useful for imagining a science-fictional war scenario?